Are Plastic Pipes a Smart Choice for Your Kitchen Plumbing? Plastic water pipes have gradually phased out the old copper ones for many reasons. The plastic that they are made out of is called PVC, which stands for polyvinyl chloride. These pipes are lightweight and are non-corrosive, unlike copper pipes which will degrade over time and are heavier. This is a “con,” but it can easily be dealt with. PVC piping can withstand temperatures up to 140 degrees Fahrenheit, or 60 degrees Celsius. While this sounds like it may be a problem, you have to remember that water that is too hot can burn your skin, so you are better off keeping your hot water heater set at a temperature that is lower than this even if you still have old copper pipes. 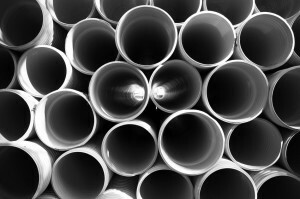 PVC pipes will last for a very long time (around 100 years or more) when installed and maintained properly. When most people think of plastic, they think of plastic water bottles and assume that plastic piping is of a similar thickness. This is not the case at all. PVC pipes are thicker, and are very sturdy. This means that they can last for years. The 100 year lifespan of them is simply an estimate, as they have not been around long enough to be fully tested. They may last even longer than that. PVC pipes can be heat sealed together or joined with a cement solvent to create a seal that will not leak. Unlike copper pipes which must be carefully joined together with washers, outer seals and other implements in order to prevent them from leaking, PVC pipes can be permanently joined together. This makes them last longer and less prone to cracking and leaking than copper pipes, especially when you consider the fact that copper pipes are more susceptible to temperature fluctuations. Questions about which type of pipes are right for your kitchen? Check out more on Infinite’s Plumbing Services here.